My constant wail for this year and beyond! So naturally I was touched by the following cartoon in today’s New York Times on the Op-Ed page. If it comes out too small to read the fine PRINT, do enlarge it, or check it out on The Times website. When linotype machine operators roamed the earth and I was a young reporter at Women’s Wear Daily in New York, I loved exiting 7 E. 12th St. via the back door. That meant walking by the presses and no sweeter sound was to hear them roar when running. I caught them in the late Sixties, just before their demise. Later, the paper was published in New Jersey where new printing technology took hold. 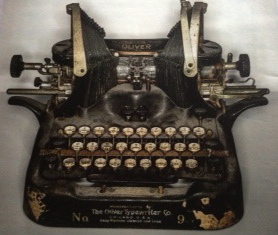 In those early days at WWD we worked on typewriters – all kinds peppered the office. None as ancient as this one, but it too caused me to reflect on those golden days at Fairchild Publications. The Oliver No. 9 (below), a model made from 1915 to 1922 belonged to Manson Whitlock, who repaired over 300,000 typewriters in his New Haven, CT shop. He began caring for these sturdy workhorses in the Thirties and died this year. The Times paid tribute to Whitlock and his craft by including him in its annual “The Lives they Lived” feature published yesterday. If I had one, I would raise an ink-stained pressman’s cap to Whitlock and that fine font, Roman Bodoni Bold! At some point – last summer? – my pal Donna mentioned the word “selfie.” I had to ask her what a selfie was, natch, hadn’t a clue. I became educated. Not that I suddenly was going to start a selfie archive, er, feed on Instagram. True, I did experiment with my iPad. Oy. What a disaster. First, one of my fingers always seemed to play a supporting role in the final result, showing up in one corner or another as a fleshy-looking smudge. As for my visage. I don’t want to go there nor do I want anybody else to. We’re talking road map in bold here. Ive read that Instagram has all these cool filters so maybe I can gauze out the wrinkles. 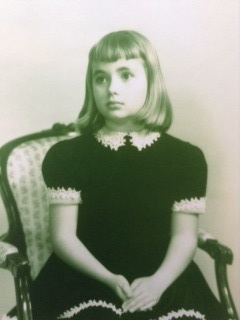 Until then, I’m supplying a kind of vintage selfie, circa early Sixties. But doesn’t the whole selfie thing beg the show-off question? The New York Times had a piece on Instagram Envy recently telling us how Instagram viewers wistfully eye those living picture perfect lives: You drooling over the selfie of the chicly turned out fem heading to Paris first class on Air France. So, yet again I’m playing catch up. New Year’s resolution: perfect selfie-taking skills in 2014.